Ashley and I loaded up our Suica cards with $50 and left Fussa station on the JR Line headed towards Ginza the next morning (Sunday, which happens to be the common day off for most Japanese). The trains were crowded with people shopping, dining and enjoying their day off in general. We made great use of our travel apps, my personal favorite is Rome2Rio and it is a Godsend when traveling around locations that require trains or metros. 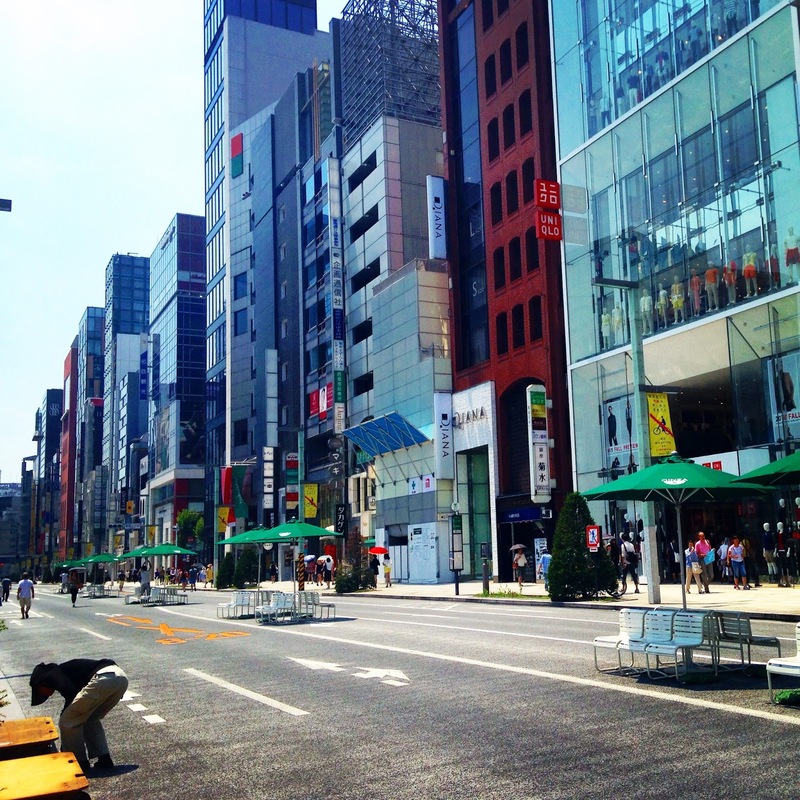 We arrived in Ginza around mid-morning. Ginza is Tokyo's high end retail area and this particular street was closed off to traffic for allowing pedestrians to stroll about. Our hotel was right around the corner. We booked the Hotel Gracery for one night at about $85 USD. The hotel was extremely elegant and the staff spoke English which was convenient. The hotel provided complimentary razors, hairbrushes, toothbrushes and toothpaste. I highly recommend staying here if you ever travel to Tokyo. The beds are not the softest but everything else is superb. After checking in and dropping our luggage off we caught the metro to Harajuku for lunch and sightseeing. 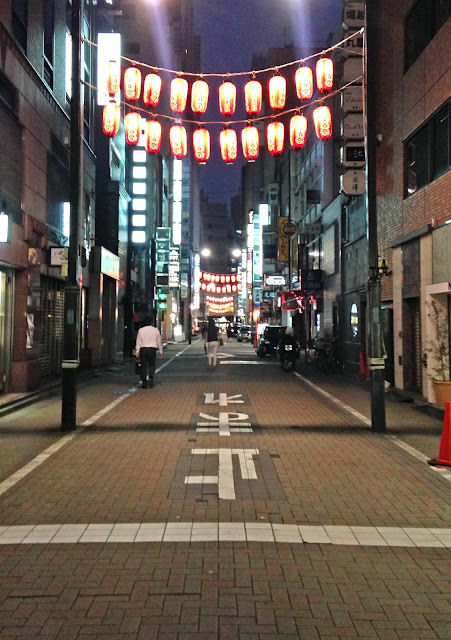 This tiny popular street brimmed with a steady stream of people darting here and there. 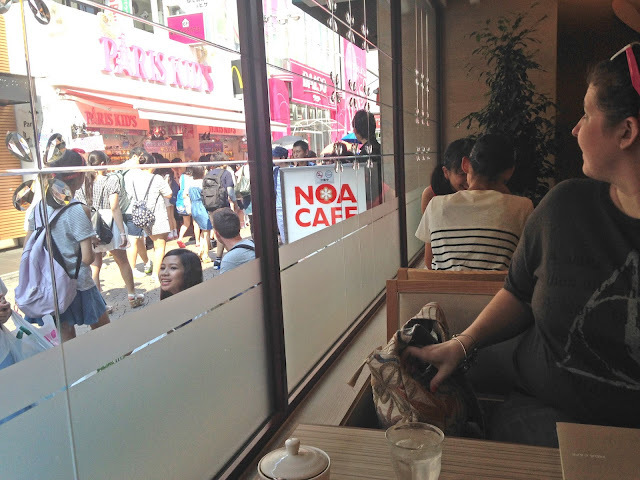 Crepes were on my list to try but Noa Cafe looked like a safe haven to sit, eat and people watch. Cafe Noa boasted a menu of delectable waffles, toasts and sandwiches. Since I was skipping the crepe I opted for an icecream, whipped cream, honey and cinnamon waffle. It was every inch of perfection. And combined with a drink of iced coffee, came to about $10. No tipping in Japan. The black cat tickled me. I quite enjoyed the Family Marts too. 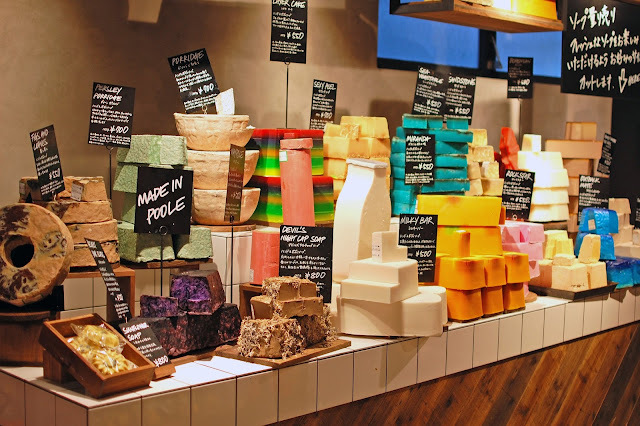 Harajuku Lush was a huge two story behemoth that displayed products a la cart like a fresh farmer's market. Ashley and I were in Lushie nirvana. We both bought a soap and bath bomb in this store. 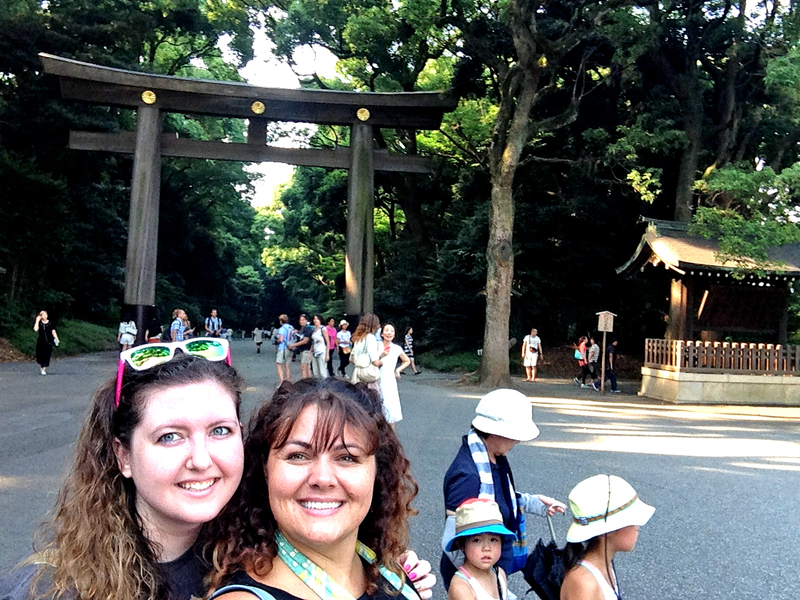 After drooling over the Lush goodies we moseyed out of Harajuku and into the Meiji Shrine and Yoyogi Park area. The ritual of cleansing needed to be followed thus: take a scoop of water and rinse your left hand, scoop and rinse your right hand, pour water into your left hand and cleanse your mouth then dip a fourth cupful and hold it vertical to rinse the scoop's handle. Now we were ready to enter the shrine (not entering through the middle but to the left or right). Ashley picked up a good luck amulet from the shrine and I bought one for my sister who is expecting. Hers is specifically for good health in children. After much walking (15 miles!!!!) we jumped a metro back to Ginza for dinner and wind down. We were starving and walking the streets. 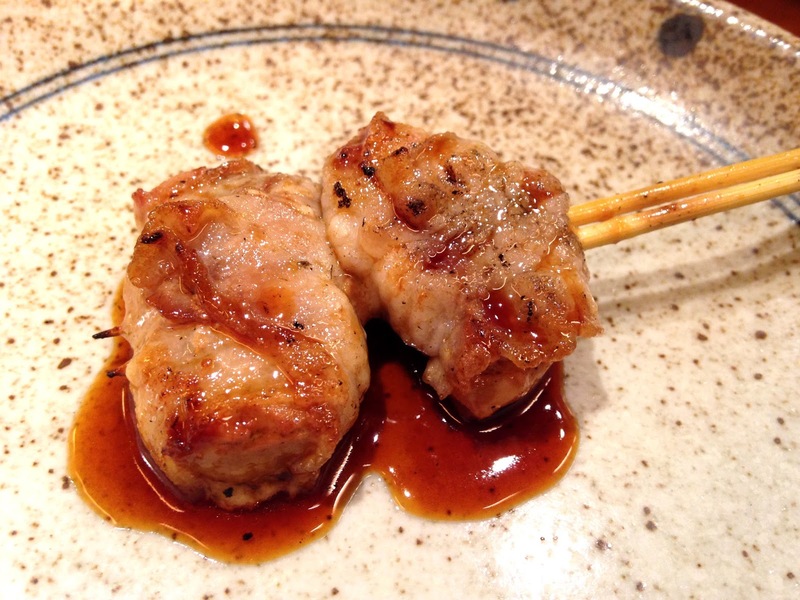 Thankfully around our last corner we spied this spot of deliciousness, a Yakitori restaurant. The meat sticks ran around $0.85 to a couple dollars each. 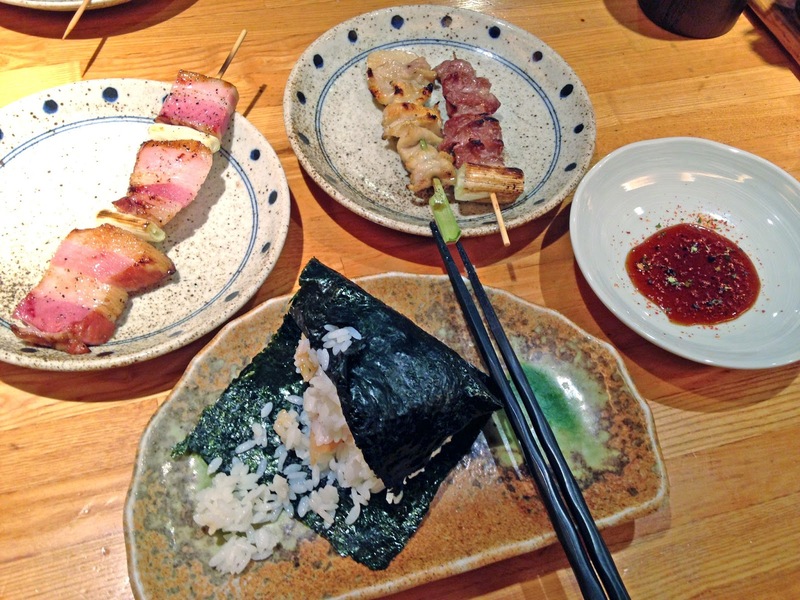 I ordered: brine cucumbers (we scarfed those before I could take a pic.... sooooo hungry), pickled plum rice ball, bacon yakitori, chicken skin yakitori, pork cheeks yakitori, and pork and foie gras yakitori. The water came in huge iced mugs and the food was smoked and grilled sublimely. I ate with relish and gusto. The bed in the hotel was not the most comfortable but all our walking made for two tired chicas and we passed out as soon as we laid down. Harajuku was fun! 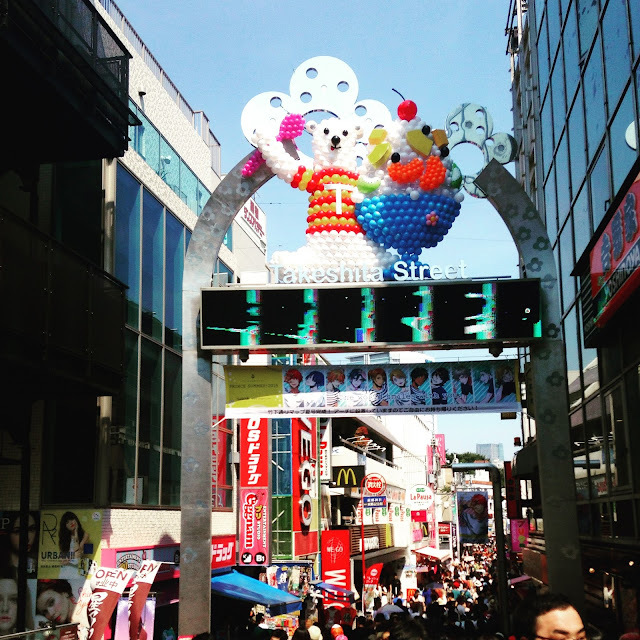 We saw quite a few Harajuku girls and a guy. It was a location that catered to the young and young at heart. We didn't really shop much there except Lush but just walking around and gazing was plenty. The following day we were headed to LeLabo in Shibuya and Sunshine City then Shibuya Crossing at night. The fun continues. :)) Are the colorfully labeled jars part of the water ceremony? It's so cool that you were able to enjoy the trip without knowing the native language. I think I would need a talking app. I am very much enjoying reliving the moments by blogging about it. The colorful jars are silk wrapped Saki barrels that were in display near the shrine. Across the way were wooden wine caskets. It was a stretch sometimes but we always ended up being able to get our points across. Some spoke English which helped. Other times Ashley's Japanese was sufficient. Ashley did use a Google translate app to read from time to time. But it is more fun to engage and try to communicate. I was nervous at first but then got over it and just did my thing. Lol! I'll have to Google that shrine. I've never heard of it. The cleansing ritual, and entering left or right, not center, is fascinating to me. Shrine etiquette had to be googled before we went in. Ashley said the middle entrance is for God only. Or something like that. There is an Emporer and Empress buried there. You have a good eye!! It did have two street lights over it but I thought they were distracting, I never saw the evil grin but now I will go back and look! Too funny! The food looks amazing, and the shrine looks peaceful and beautiful! Can't wait to hit installment #3! Thank you Gil! It was hard narrowing down the pics. Took a metric ton of them. Oops! I should have been more descriptive! Sorry! Lol! 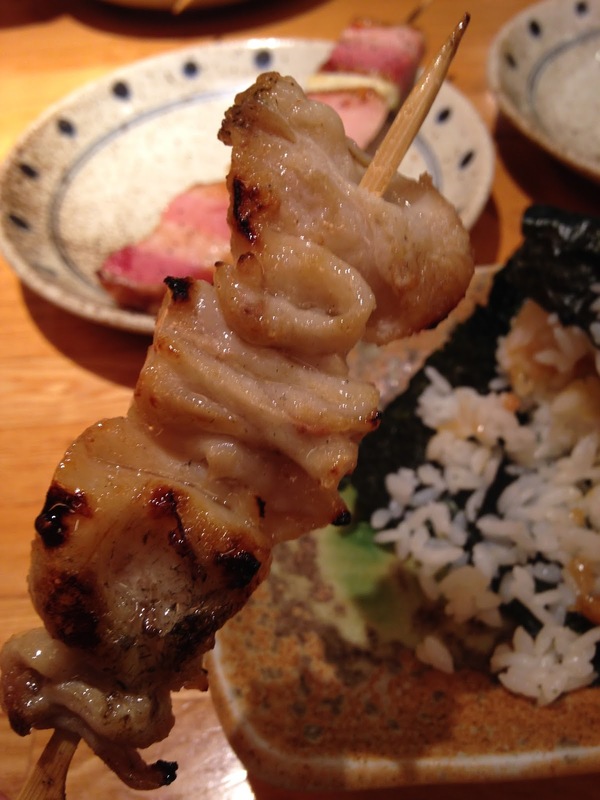 Some of the things were Japan exclusive but different sales reps said different things so I hesitate to name them. But I will be posting my Lush haul in a few days <3 So many yummy smelling things! I love looking at your photos & reading about your journey! Looks like an amazing trip!! Thanks Tricia! It was a trip I will cherish for a lifetime! I am so thankful I was able to go! 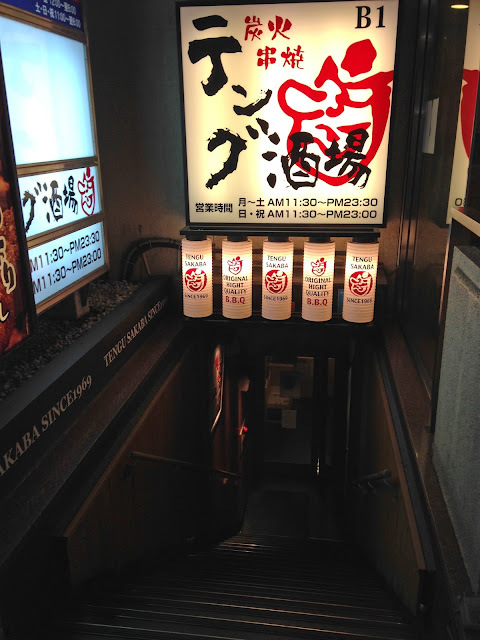 This makes me wanna go to Japan!! GREAT photos and stories. I am so stoked you got this experience. Livin' large, Julie J!